There was excitement all around me and an energy that was full of anticipation as we waited for the program to begin. We had been on our feet singing and clapping and praising God... and wondering what would come next. I certainly didn't have any more expectations, the praise & worship music had already exceeded them. And then... it was like a parade entering the Super Dome, and the energy rose up another level. Banners on tall poles, and streamers and so many people. They were singing Reign on, I will not drown, I'm standing here on Higher Ground. After the streamers and banners had made their way into the Dome, with much dancing and singing and celebrating, here came a pick-up truck. Old, but not quite a clunker. And there was a man riding in the back. Honestly, I didn't have a clue as to what was going on... but later realized it was all part of the drama that would continue on all week... bits and pieces of a story played out on the stage. Bits and pieces of The Story. Little did I know how much it would mean to me in the end. The man in the truck? Jesus. Arriving to all sorts of glorious shouting; coming into the city of Jerusalem. Not in a fancy new car, but a beat-up truck... a humble mode of transportation... a modern day version of a donkey. And while there were no palms or Hosannas, there was plenty of celebration. All week the story progressed. The disciples we know... portrayed by teens, in teen situations. Perhaps the version of what might happen today, if Jesus had been made to wait 2000 years. I was intrigued by each scene... from His arrival in glory, every step along the road to the cross, and through to the Ascension. All of a sudden, it felt personal. Real. The telling of this story in this way was something that I could understand and relate to. And it was the Crucifixion that broke me. This Jesus... He wore an orange jumpsuit. That alone, broke my heart. And the guards... they taunted and beat him. It hurt me. Physically. To see Jesus in jail attire. To watch Him being beaten and shoved as if He were... nothing and no one... when I knew who He was. And how special. 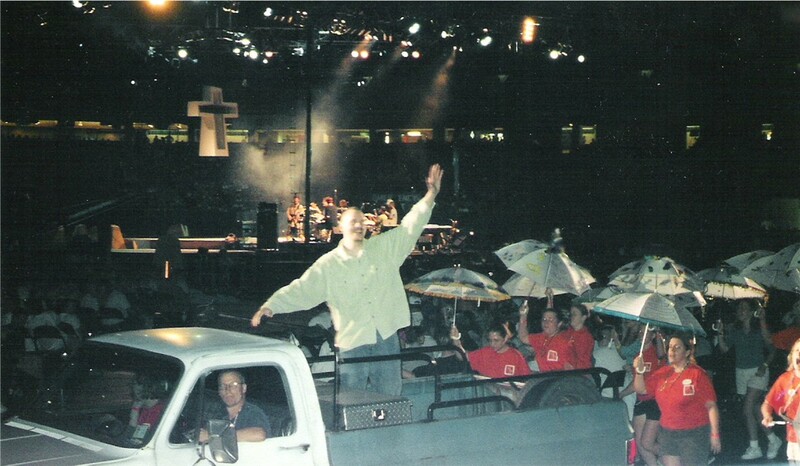 And that white cross... that had been the centerpiece of our week, had been lowered from the heights of the stadium and was suddenly sitting on the stage. That beautiful, pristine white cross, that had been emblazoned on every bible, backpack and program, was now the tool of the Crucifixion. The cross was a frame, hollow, and until that moment, I had not realized how large it was... or that it had walls of glass on either side. And then there was Jesus... being shoved into the frame of the cross. Closed in, hands bracing... the cross returned to its place, lifted high above the crowds for all to see. The only shouts of Crucify Him! came from the stage. The rest of us... the 35,000... simply stood and watched. My own eyes were blurry from the tears, but still focused on Jesus. My heart, aching from a pain I had never known. In that moment, I think I realized for the very first time, that Jesus had died for me. Being there that day, that week... it changed my faith. It changed my life. Sometimes He comes in a whisper... and sometimes in a grand parade. As for me... He came in a football stadium filled with teenagers. And my life... has thankfully never been the same. Oh, my. Oh, oh, oh. I can't quite think of what to say. I'm not sure how you stood the pain of seeing Him in a prisoner's jumpsuit. Or being beaten. It's so easy to think of the Crucifixion in very far-away, distant terms. God forgive me. I rejoice that your life was changed that week. Because now you're you, and I am so glad. What a beautiful experience. I too would have been touched by this. YOU my friend, you remind me of the real meaning of Easter...all the time. wow dawn, what a powerful experience. I am still stuck on the orange jumpsuit image...wow. What powerful imagery. Thanks for linking up & as always, for sharing from your heart. Happy Easter, friend!